The firm is delighted to welcome Dorothy Price and Jack Stainthorpe to its residential conveyancing team and Katie Ward and Elizabeth Whitaker to the Wills Trusts and Probate department. 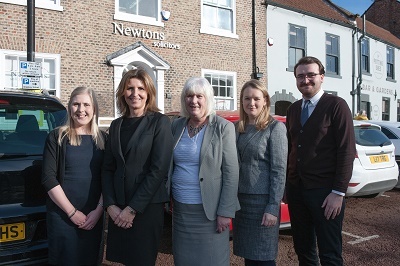 The new team members will work across Newtons offices in Thirsk, Richmond and Northallerton. Elizabeth Whitaker, a solicitor who has relocated to Yorkshire from Cirencester, (where she worked for Sewell Mullings Logie LLP) will be based in Richmond. Elizabeth specialises in advising individuals in all aspects of Wills, Probate and Trust law and is a member of STEP, the Society of Trust and Estate Practitioners. Katie Ward, is a solicitor who advises clients on everything from preparing Wills and Letters of Wishes to administering Estates. She joins the team from Coles Solicitors and will be based in the Northallerton office. Dorothy Price, a conveyancing executive with over 40 years’ experience in all aspects of residential property transactions, also joins Newtons from Coles Solicitors and will be based at the office in Thirsk. Jack Stainthorpe, a conveyancing executive, who has recently worked at Latimer Hinks in Darlington, will be based in Northallerton. Jack is experienced in all aspects of residential property transactions including sales and purchases. The latest recruitment drive from Newtons Solicitors has also seen two internal moves. Frances Maxwell, a senior private client solicitor, has moved from Leyburn to Northallerton to manage the team. Estella Prince, a senior solicitor and an expert in dispute resolution, will also now be based in Northallerton, working with the litigation team. Newtons has seen considerable growth since moving into its new office in Northallerton, which was previously occupied by Armstrong Watson Accountants. The team continues to provide a high-quality service to clients that it previously worked for from its Leyburn office. As well as offering an enhanced service to clients, Newtons enjoys strong connections with the local community. For example, David Lucas, one of Newtons commercial solicitors lives in Northallerton and is involved with the Northallerton BID: a programme working with local businesses to make the town vibrant and prosperous.